Download "Applying Agile Methods in Rapidly Changing Environments"
1 Applying Agile Methods in Changing Environments 7/23/ Applying Agile Methods in Rapidly Changing Environments Peter Kutschera IBM Unternehmensberatung GmbH Am Fichtenberg 1, D Herrenberg Steffen Schäfer IBM Unternehmensberatung GmbH Leopoldstraße 175, D München 1 Introduction Software development approaches have changed significantly throughout the last decade. Until the recent emerge of e-business, software development projects were mainly targeted at the implementation of well-known business processes. Projects took typically several months or even years to complete. After completion, only those projects were considered successful which implemented all of the given requirements correctly and completely. Due to the perception that it is economically much cheaper to detect errors in the project s life cycle early, a classical software engineering approach for software development projects has been used. The idea was to flawlessly fix the given requirements and then to set up a relatively detailed design before starting with the implementation. This has been accomplished by writing comprehensive documentation which was later thoroughly reviewed to find as many errors as possible. Although this method has been applied somewhat successfully to software development projects in the past, the approach is not suitable for commercial projects in the era of e-business where things are moving fast. Due to the fact that many project development efforts are using leading-edge technology that is not yet well understood or even evolves during project lifetime and the underlying business models typically rely on a quick time-to-market, it is impossible to pin down a complete requirements list at the onset of a project. Project goals and system functionality need to be frequently adapted, in order to stay competitive in marketplace. Limited timeframe of many projects, of sometimes only a few weeks instead of months, as well as the necessity to quickly respond to changing business needs, are all demanding for a different approach for software development. This is why a lot of well-known methodologists proposed lightweight approaches for software development during the past two years or so. 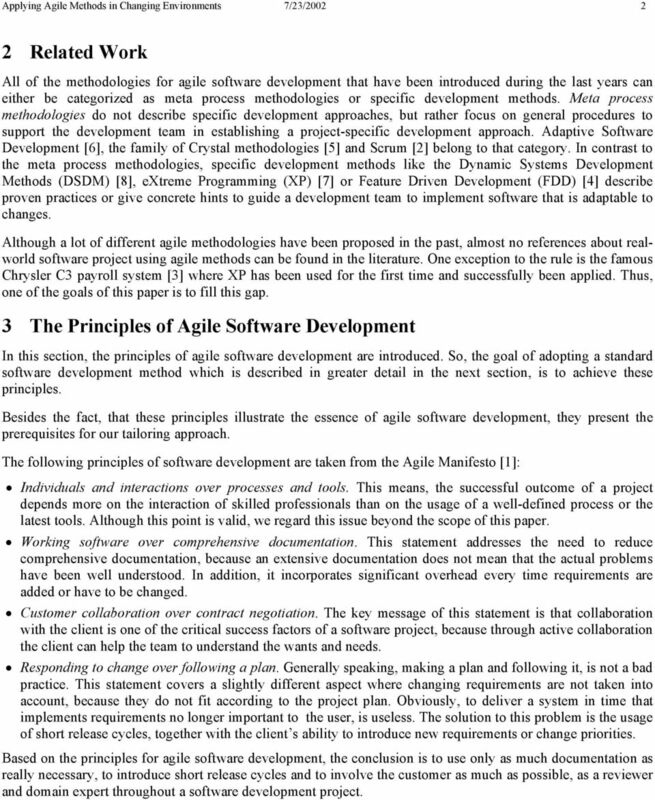 In February 2001, those methodologists formed the Agile Alliance and presented their manifesto  for software development. Due to this fact, it is expected that a larger community in software industries will regard the agile software development approach with its evolutionary aspects as a viable alternative to the classical software engineering approach for projects in changing environments. 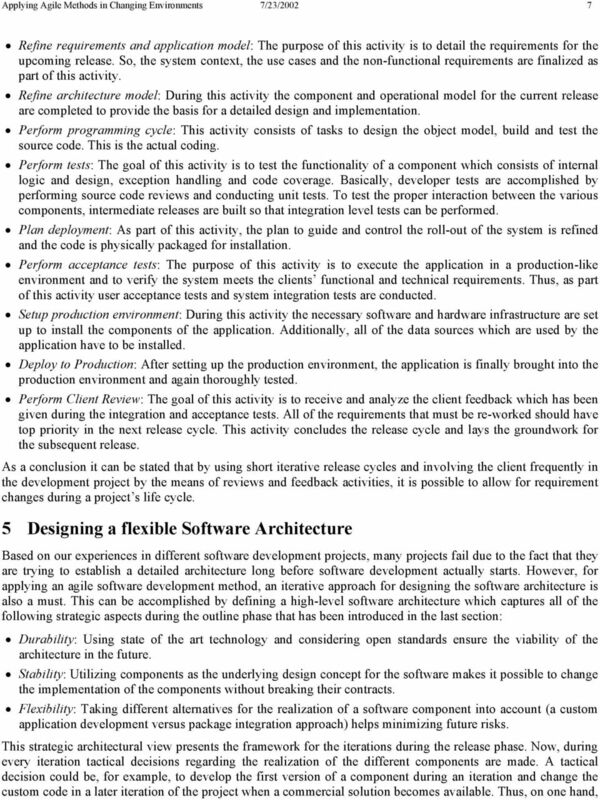 The approach for agile software development presented in this paper is targeted at commercial software development projects and is based on IBM s Global Services Method. We use a more traditional, but incremental software engineering approach as a base and adapt this to specific needs in rapidly changing environments. We have used this approach because we believe that certain software development methodologies can be adapted to become agile. Also, our project teams are able to use a development method they are familiar with, rather than applying a totally new one. The adaptation consists of two steps. As a first step, the number of artifacts which have to be produced throughout the project is significantly reduced to put more focus on working software than on documentation. Second, we introduce a project organization with short iterative releases, in order to enhance the client s opportunity to provide feedback and to drill down or introduce additional requirements. Besides the use of a methodology which is able to cope with requirement changes, the underlying software architecture plays an important role in the overall development project, because it must be flexible enough to incorporate new requirements without breaking the code that has already been developed. 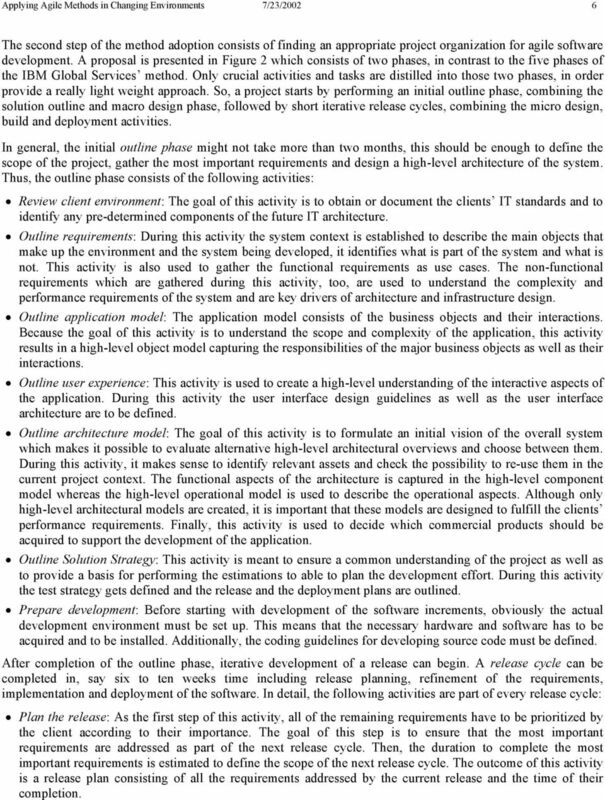 The issue of designing a flexible software architecture is addressed in this paper, before we conclude with a case study where the usage of the approach presented in this paper has been successfully demonstrated. 2 Applying Agile Methods in Changing Environments 7/23/ Related Work All of the methodologies for agile software development that have been introduced during the last years can either be categorized as meta process methodologies or specific development methods. Meta process methodologies do not describe specific development approaches, but rather focus on general procedures to support the development team in establishing a project-specific development approach. Adaptive Software Development , the family of Crystal methodologies  and Scrum  belong to that category. 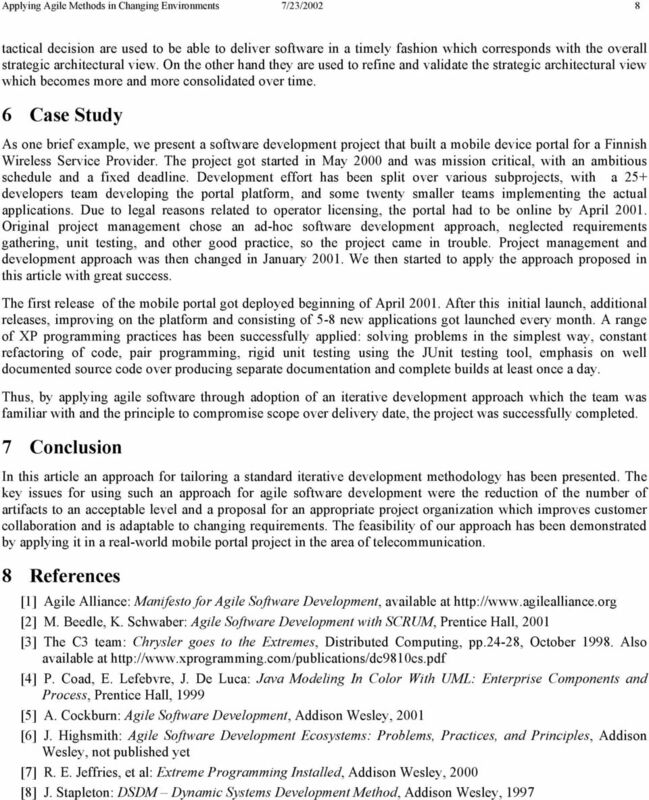 In contrast to the meta process methodologies, specific development methods like the Dynamic Systems Development Methods (DSDM) , extreme Programming (XP)  or Feature Driven Development (FDD)  describe proven practices or give concrete hints to guide a development team to implement software that is adaptable to changes. 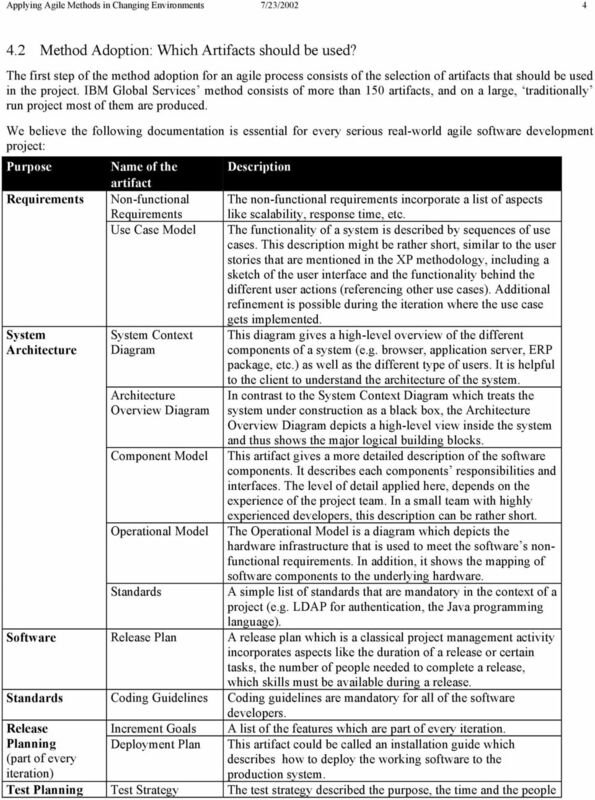 Although a lot of different agile methodologies have been proposed in the past, almost no references about realworld software project using agile methods can be found in the literature. One exception to the rule is the famous Chrysler C3 payroll system  where XP has been used for the first time and successfully been applied. Thus, one of the goals of this paper is to fill this gap. 3 The Principles of Agile Software Development In this section, the principles of agile software development are introduced. So, the goal of adopting a standard software development method which is described in greater detail in the next section, is to achieve these principles. Besides the fact, that these principles illustrate the essence of agile software development, they present the prerequisites for our tailoring approach. The following principles of software development are taken from the Agile Manifesto : Individuals and interactions over processes and tools. This means, the successful outcome of a project depends more on the interaction of skilled professionals than on the usage of a well-defined process or the latest tools. Although this point is valid, we regard this issue beyond the scope of this paper. Working software over comprehensive documentation. This statement addresses the need to reduce comprehensive documentation, because an extensive documentation does not mean that the actual problems have been well understood. In addition, it incorporates significant overhead every time requirements are added or have to be changed. Customer collaboration over contract negotiation. The key message of this statement is that collaboration with the client is one of the critical success factors of a software project, because through active collaboration the client can help the team to understand the wants and needs. Responding to change over following a plan. Generally speaking, making a plan and following it, is not a bad practice. This statement covers a slightly different aspect where changing requirements are not taken into account, because they do not fit according to the project plan. Obviously, to deliver a system in time that implements requirements no longer important to the user, is useless. The solution to this problem is the usage of short release cycles, together with the client s ability to introduce new requirements or change priorities. 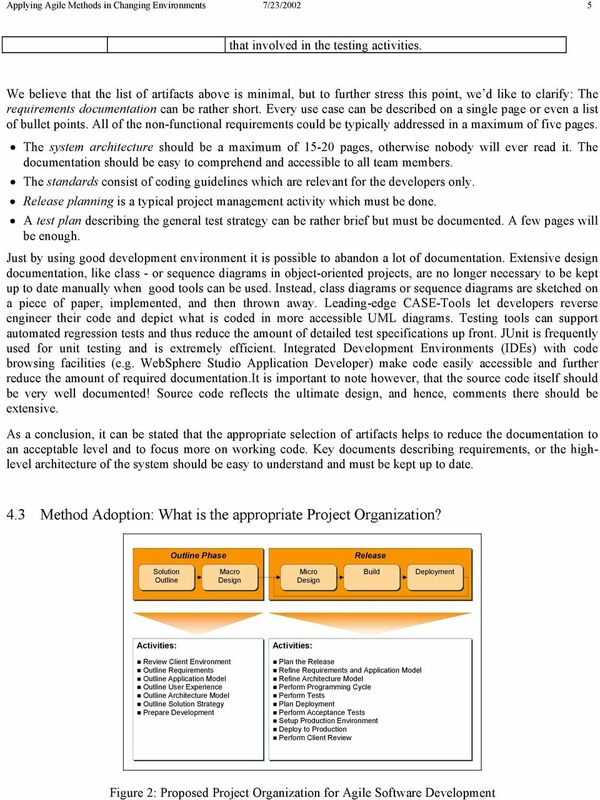 Based on the principles for agile software development, the conclusion is to use only as much documentation as really necessary, to introduce short release cycles and to involve the customer as much as possible, as a reviewer and domain expert throughout a software development project. 6 Applying Agile Methods in Changing Environments 7/23/ The second step of the method adoption consists of finding an appropriate project organization for agile software development. 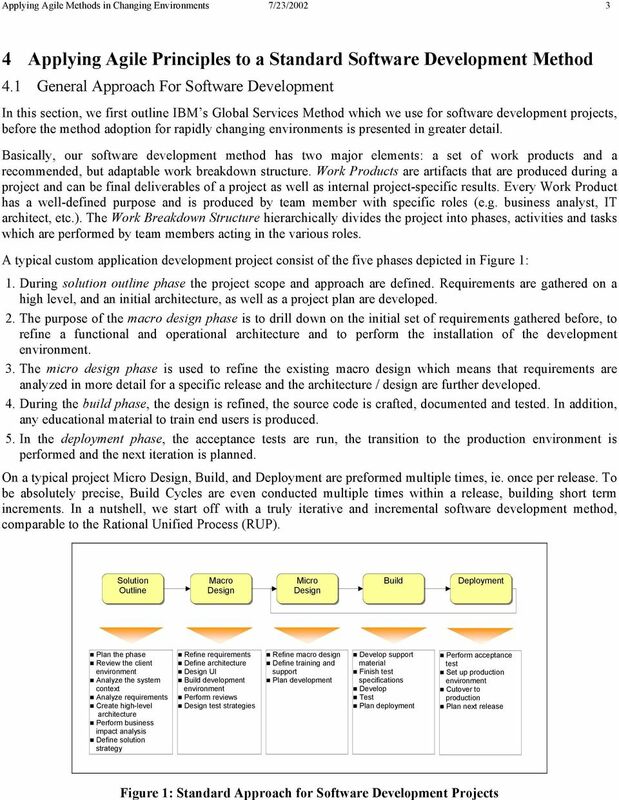 A proposal is presented in Figure 2 which consists of two phases, in contrast to the five phases of the IBM Global Services method. Only crucial activities and tasks are distilled into those two phases, in order provide a really light weight approach. So, a project starts by performing an initial outline phase, combining the solution outline and macro design phase, followed by short iterative release cycles, combining the micro design, build and deployment activities. In general, the initial outline phase might not take more than two months, this should be enough to define the scope of the project, gather the most important requirements and design a high-level architecture of the system. Thus, the outline phase consists of the following activities: Review client environment: The goal of this activity is to obtain or document the clients IT standards and to identify any pre-determined components of the future IT architecture. Outline requirements: During this activity the system context is established to describe the main objects that make up the environment and the system being developed, it identifies what is part of the system and what is not. This activity is also used to gather the functional requirements as use cases. The non-functional requirements which are gathered during this activity, too, are used to understand the complexity and performance requirements of the system and are key drivers of architecture and infrastructure design. Outline application model: The application model consists of the business objects and their interactions. Because the goal of this activity is to understand the scope and complexity of the application, this activity results in a high-level object model capturing the responsibilities of the major business objects as well as their interactions. Outline user experience: This activity is used to create a high-level understanding of the interactive aspects of the application. During this activity the user interface design guidelines as well as the user interface architecture are to be defined. Outline architecture model: The goal of this activity is to formulate an initial vision of the overall system which makes it possible to evaluate alternative high-level architectural overviews and choose between them. During this activity, it makes sense to identify relevant assets and check the possibility to re-use them in the current project context. The functional aspects of the architecture is captured in the high-level component model whereas the high-level operational model is used to describe the operational aspects. Although only high-level architectural models are created, it is important that these models are designed to fulfill the clients performance requirements. Finally, this activity is used to decide which commercial products should be acquired to support the development of the application. Outline Solution Strategy: This activity is meant to ensure a common understanding of the project as well as to provide a basis for performing the estimations to able to plan the development effort. During this activity the test strategy gets defined and the release and the deployment plans are outlined. Prepare development: Before starting with development of the software increments, obviously the actual development environment must be set up. This means that the necessary hardware and software has to be acquired and to be installed. Additionally, the coding guidelines for developing source code must be defined. After completion of the outline phase, iterative development of a release can begin. A release cycle can be completed in, say six to ten weeks time including release planning, refinement of the requirements, implementation and deployment of the software. In detail, the following activities are part of every release cycle: Plan the release: As the first step of this activity, all of the remaining requirements have to be prioritized by the client according to their importance. The goal of this step is to ensure that the most important requirements are addressed as part of the next release cycle. Then, the duration to complete the most important requirements is estimated to define the scope of the next release cycle. The outcome of this activity is a release plan consisting of all the requirements addressed by the current release and the time of their completion. 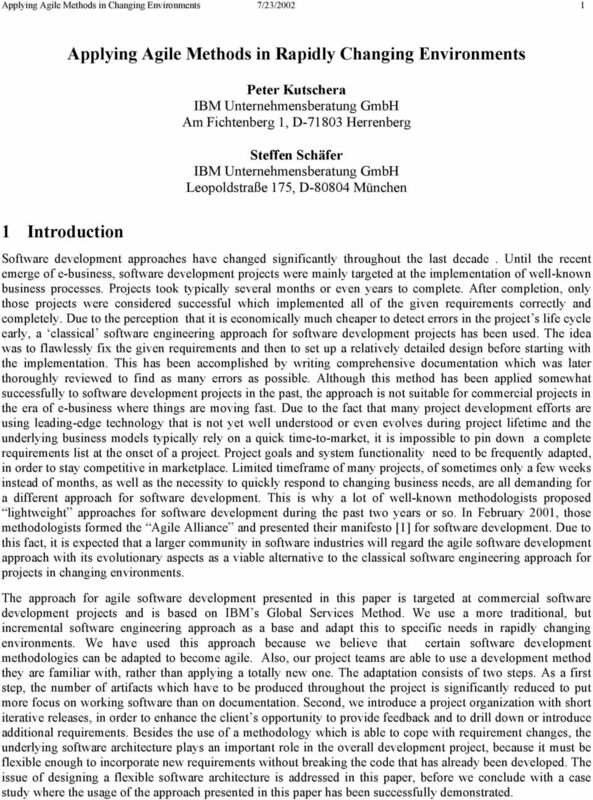 AGILE SOFTWARE DEVELOPMENT Michael Novikov and Nicolas Heuser May 23, 2006 1 Contents 1 THE TIME BEFORE AGILE SOFTWARE DEVELOPMENT 3 2 ADAPTIVE VERSUS PREDICTIVE SOFTWARE DEVELOPMENT 3 3 WHAT IS AGILITY? Why process models? Topic 3 Software process models. 3. Process models. What is a process model? Software Process. Process: A sequence of activities, subject to constraints on resources, that produce an intended output of some kind. AGILE SOFTWARE DEVELOPMENT BY Sysop Technology Aurangabad-431003 Abstract: Software development which can be delivered fast, quick adaptation to requirements and collecting feed back on required information. Title: Topic 3 Software process models (Topic03 Slide 1).